Pan-pacific-festival.com is best viewed using the latest versions of Chrome, Firefox and Microsoft Internet Explorer. To best view pan-pacific-festival.com site please set your resolution of your monitor to 1024x768 or higher to ensure you can view the full width of pan-pacific-festival.com web site in your browser window. Pan-pacific-festival.com site makes use of pop-up windows to display certain information and contents. If you are using software/add-ons/plug-ins that prevents pop-up windows, please disable it while browsing our site. As there are many tools on the market which block popup windows, please refer to the documentation of your browser or plug-in software to find out how to enable the popups for this visit. If you are experiencing any issues such as inability to view our main menu or missing content, please ensure that both Java and Java Script are enabled in your browser. As there are many browsers on the market, please visit your browsers website for detailed instructions on how to do this. Our servers like most others, track IP addresses and referring pages to help with site maintenance and improvements. This data is viewed only as anonymous statistics to show the busiest times of the day or week, pages with errors and how effective our advertising has been. This information is not used for any other purpose. This information allows us to process and reply to your inquiry. We store information from your inquiry to allow us to respond back to you in an appropriate manner. Again, this information is regarded as confidential, is for our internal use only and will never be disclosed to other parties. 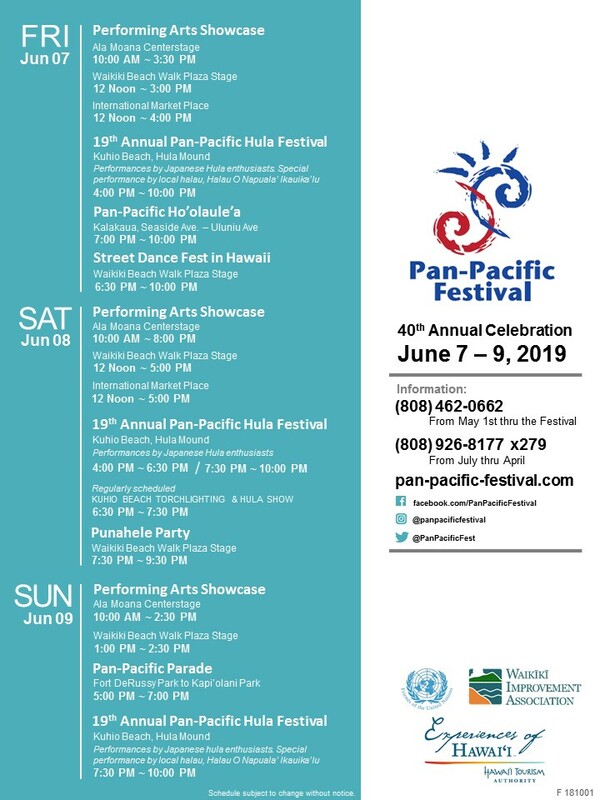 Pan-pacific-festival.com may occasionally provide links to other sites for your convenience or additional information. Pan-pacific-festival.com is not responsible for any content or practices of these sites.